It is often said that if something is repeated often enough, it becomes accepted as true. This has certainly been the case for the link between terrorism and the poaching of elephants for the ivory trade. A wide range of public figures have repeated the claim that ivory plays a major role in bankrolling terrorist organizations in Africa. These include former US secretary of state Hillary Clinton, UK foreign secretary William Hague and Kenya’s president Uhuru Kenyatta. The most recent voice to be added to the choir was that of cinema director Kathryn Bigelow. The Oscar-winning director teamed up with charity WildAid to create a short video asserting that trade in ivory is funding the Somali terrorist group al-Shabaab, responsible for the 2013 Westgate Mall attack in Kenya in which 67 people died. As with any illegal activity, it is very difficult to obtain reliable data on the size of the ivory trade. Although there is evidence that it has been used to finance armed groups in Africa such as the Lord’s Resistance Army or the Janjaweed in Darfur, the allegations linking ivory to terrorist groups are much weaker. They essentially rest on a single report published by the Elephant Action League in 2012. The report asserts, based on a single unnamed “source within the militant group”, that al-Shabaab makes between US $200,000 and US $600,000 from ivory, up to 40% of its income. This over-reliance on a single source and the fact that only a short “journalistic summary” of the report was ever released, has led to skepticism. Recently, a joint report by INTERPOL and the UN Environmental Program classified EAL’s claims as “highly unreliable” as they would require al-Shabaab to bring nearly all ivory poached from west, central and eastern Africa to a single Somali port. However, this same report establishes a solid link between al-Shabaab’s finances and another environmental crime: illegal charcoal production. 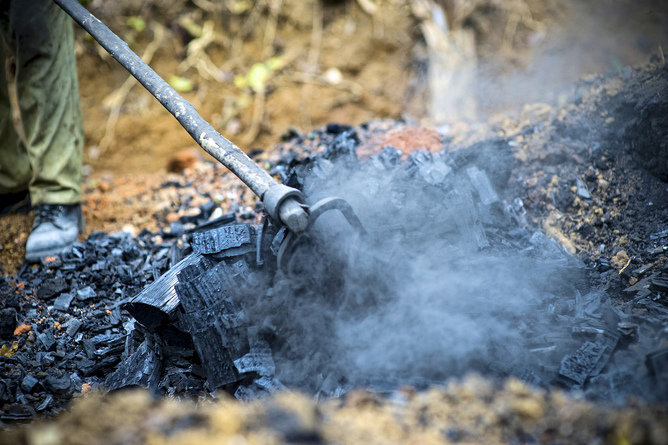 The trade in charcoal leads to widespread deforestation and is already driving erosion and desertification in parts of Somalia. Al-Shabaab’s main financing mechanism appears to be the taxing of charcoal coming to the port of Baraawe (and until recently Kismayo) south of Mogadishu, with the value of the trade estimated to be US$ 38–56 million per year. This means that, even if the EAL’s inflated ivory estimates were true, the trade in charcoal would still generate 60 to 94 times more revenue for al-Shabaab. We’ve known about the charcoal trade in the Horn of Africa for a while now – the UN, for instance, highlighted the issue in a 2013 monitoring report on the Somali conflict. It is thus puzzling that some western political and conservation figures have decided to focus on the unproven link between ivory and terrorism instead of the more relevant and substantiated conservation issue. A possible (yet cynical) explanation is that those highlighting the issue are trying to gain notoriety by bringing together terrorism, a top issue for all western governments, and the elephant, one of the most widely used conservation flagship species. This would surely generate more attention than the more abstract issue of desertification and a few obscure tree species. The increased visibility could then be used to generate extra votes, donations or simply a more environment-friendly image. If this was the case, then we would for example expect these efforts to focus on those more likely to vote or donate, instead of those more likely to buy ivory. In the case of Kathryn Bigelow’s video and the “Last days of ivory” campaign it spearheads, all materials are only available in English, a language not relevant for the key ivory markets in Southeast Asia. All the first four actions proposed to those who visit the campaign’s website revolve around either sharing the campaign image and content on social networks or donating to the associated charities. This campaign does indeed appear to be targeting those who can donate rather than those who can directly impact the ivory trade. Those involved clearly have something to gain from pushing the link between ivory and terrorism beyond the available evidence. However, it is also clear that in the long run it is not only their own credibility that is at risk but that of a whole conservation movement. Conservationists have focused large on messages of doom and gloom that often sound as if holding humanity for ransom if the environmental crisis is not addressed. If we are serious about keeping the public’s trust, we must ensure that we are driven by evidence, not the hype, lest we become the boy who cried wolf. Diogo Veríssimo, David H. Smith Conservation Research Fellow at Georgia State University, does not work for, consult to, own shares in or receive funding from any company or organisation that would benefit from this article, and has no relevant affiliations.